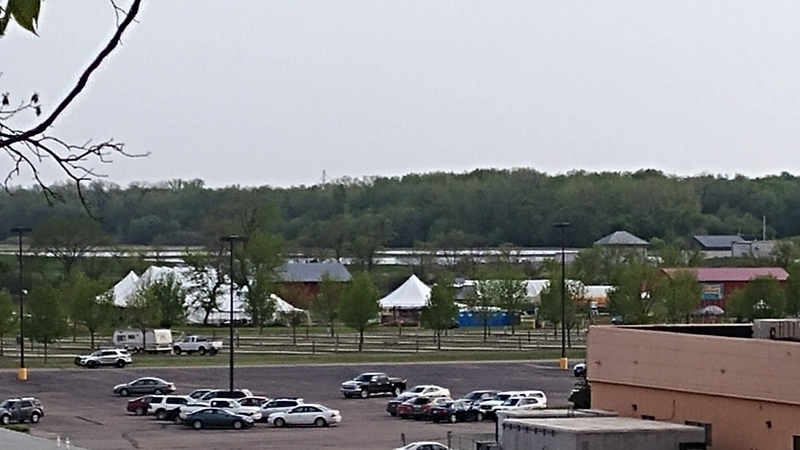 The Meskwaki Red Gardens as seen in the distant and the Meskwaki Bingo and Casino convention center to the right, played host to the 2018 Great Lakes Intertribal Food Summit, held May 9-13, at the Meskwaki Settlement near Tama, Iowa. Over five days a couple hundred participants, presenters, vendors and visitors spent time learning about traditional foods, understanding plants, food issues, uses for medicine, mentoring with Indigenous chefs, consulting with gardeners and others involved in the greater Native Food Sovereignty movement. A final report and photo display is presented here to celebrate the new found relationships, the intellectual feed and the gorgeous food that was provided and cooked by our chefs while at the Meskwaki Settlement with both traditional and contemporary production practices utilized. There were over 60 workshops for hands-on learning opportunities and for asking about or sharing information. The Summit opened up on Wednesday May 9th with sunny skies and over a dozen hands-on workshops involving traditional implements like making Botagens (Corn Mortars), building a Wikiup (Traditional Meskwaki structures), constructing Haudenosaunee Planting Sticks, Cooking Paddles, Pottery and Birch Bark Canisters. Stealing the day in a special way, was the putting down of a Bison and its butchering — involving some of the chefs and many volunteers who watched and participated in identifying and separating numerous bison parts for food, ceremonial and craft supply needs. While many of the workshops that followed that morning were pre-registered and some with a small cost, no participants who wanted to watch or converse about any of the topics were turned away. These hands-on workshops, some which took place on other days as well, included a number of demonstrations of finished products and give participants a connection to the implements that they might prefer to work with in the garden and craft shop if they were to undertake various tasks such as grinding corn or wild rice in a traditional botagen as seen below (lower left). Also participants made clay pots and viewed the proper use of a Haudenosaunee planting stick after making one for themselves. Several afternoon workshops involved technical information presented by the USDA Natural Resources Conservation Service (NRCS) and Indian Health Service representatives who introduced both conservation planning and IHS food safety training for handling and processing food safely and provided information on other programs and funding that might be available for tribal communities to access. During the following days participants had over 60 workshop to participate in with great discussions that took place through-out the Red Gardens of the Meskwaki Settlement and from inside their Hotel-Casino Convention Center. Always a favorite were discussions about seeds, trading seeds, planting trends, ricing and making maple or other types of syrup and value added products for the home cupboard or vending. Some of workshops included Making Wood Ash Hominy, (Ojibwe, Oneida, Onondaga Styles) along with a traditional Meskwaki Traditional Foods Demo, making Milkweed Soup, Processing and Using Acorn Flour and many other activities that brought the community around a newly erected cooking pavilion that will be available in the future for the community to use. During the conference the cooking pavilion was used for both display of goods, baskets, clay pots, traditional cooking tools, and for experimental use of cooking — for example a batch of maple syrup was rendered down to sugar, in a clay pot, an event that some people in the maple industry have claimed (outside of the Indigenous Community) could not be done, or was too inefficient. As much as the butchering of the bison took up a lot of attention, the ethical use of animal and food products have always been stressed as necessary both to ensure an abundance of food product supplies in the future but also to maintain a good spiritual relationship of respect as well. For example some people enjoyed participating in both the butchering and the preparation of squirrel, ducks and beaver and followed the process through into the kitchen and on to the serving table. Others who had followed the butchering of the bison took on the responsibility to make sure that every part of the bison was utilized to the best of our ability, on the spot, while others spent hours helping tanning hides for future use. Of course one of the greatest assets that the annual Great Lakes Intertribal Summit brings to the table is the large number of Indigenous chefs who organize themselves and the menu, a lot of time based on what is donated or shows up from around the country. Each year the team of chefs seem to out do themselves while showcasing the idea that Indian Country once provided for all their own food needs, and from a local base of seasonal products at that. The chefs work with diverse foods, diets, spices and cooking facilities to over come all kind of obstacles that occur when you show up with almost nothing but a whole lot of culinary cooking skills, knowledge and ice cooler donations of meats, plants, spices, nuts, flours and other supplies from all across Indian Country. And here are some of the results of five days of culinary heaven (for some). Don’t be mad, be hungry and attend next year’s Intertribal Food Summit. A special thanks to Dave Shananaquet for the painting he made during the conference and his donation of it during the auction that helped raise money for student projects and stipends for our future culinary youth. And our greatest gratitude to the people of the Meskwaki Settlement, and their Food Sovereignty Initiative, all who went out of their way to host our organization and the many visitors that came from through-out the North American continent. The success of the event was based on their input and help that we received from the community and each and every participant. THANK YOU!! This entry was posted in Event and tagged #foodsummit, #IAC by Skabewis. Bookmark the permalink.